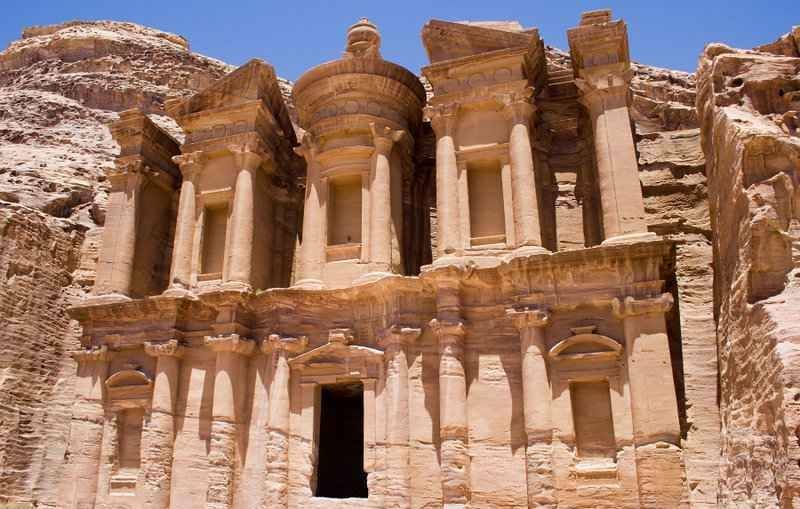 Petra Day Trip : Petra Established possibly as early as 312 BC as the capital city of the Nabataeans, it is a symbol of Jordan, as well as its most visited tourist attraction. It lies on the slope of Mount Hor in a basin among the mountains which form the eastern flank of Arabah “Wadi Araba”, the large valley running from the Dead Sea to the Gulf of Aqaba. Petra has been a UNESCO World Heritage Site since 1985. • Your first stop, will be in Wadi Musa, to stock up with film, food or souvenirs from the rest house, then go ahead to the Siq. • Before your entrance to the Siq, on your left hand, there is a Petra Obelisk tomb, with a five graves, four of them represented in a pyramid shape and one in Statue shape. • Upon your entrance to the Siq, you will see the remains of a cermonal arch, built by Nabataeans. • After 1.5 Kilometer of winding around, the Siq will open on the most impressive of Petra monuments, which called El=Khazna(The Treasury), carved in the solid rock. • Next to El-Khaznah, the Siq will turn right and lead you to some niches, tombs, and the Amphitheater. • After the Amphitheater, the Siq is going wide and lead you to the main part of Petra monuments, which will be The Royal tomb or the Palace tomb. 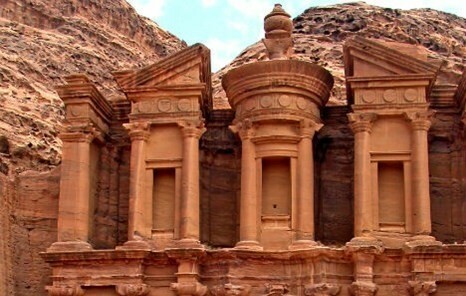 • By the end of your tour in Petra, you will go to have lunch in a five star hotel. • Next to lunch, drive back to Aqaba, then join the ferry boat to Taba. • Meet & assist in Taba, then drive back to Sharm el-Sheikh. • All transportation by air Conditioned buses. 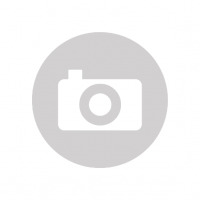 • Ferry boat tickets Newbie-Aqaba-Newbie. • Departure taxes in both side of Egypt and Jordan.